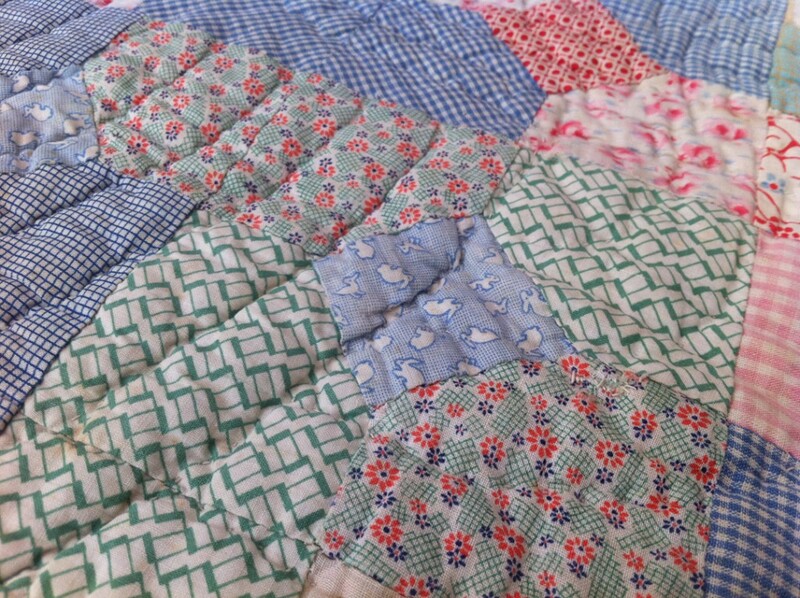 We’re still unpacking from our move, and then re-packing for our family vacation (an unfortunate fluke of scheduling that they fell right on top of one another, but one does not look a home sale or a vacation in the mouth, as it were), so I’ve lined up some guest posts based on my vintage quilt from a few weeks back. 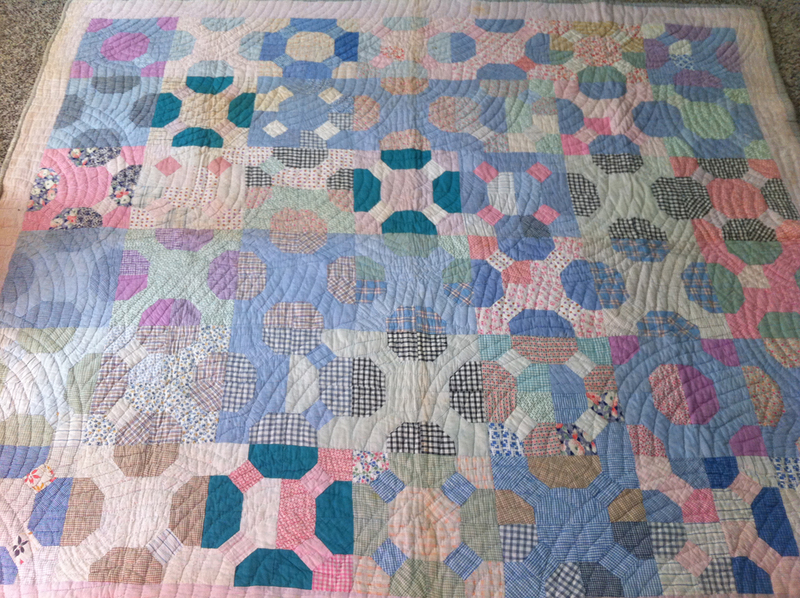 Today, Eliza of Dear ‘Liza writes about her inherited quilt, which she’s brave enough to put back into regular rotation. 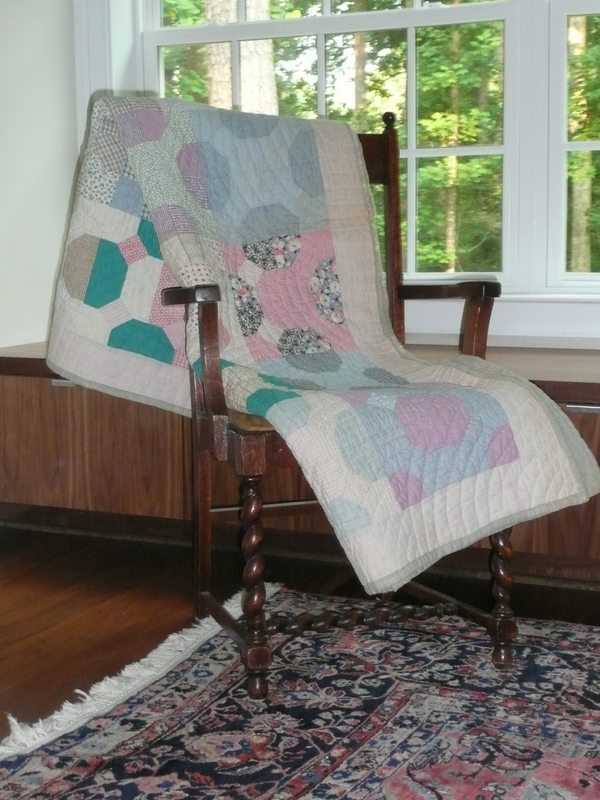 I still have guilt about shredding the quilt my mother gave me, but if any of you have suggestions for vintage quilt care, there are a lot of us who would love to share! Her home was full of treasures, junk, and stuff that qualified somewhere in between. I was engaged at the time to my (now) husband and about to move into our first non-college apartment. Because we were in need of furniture, I got a chair and a table; both were painted the most horrific shade of Pepto-Bismol pink you’ve ever seen. I also got my great-grandmother’s biscuit cutter (which I use frequently) and a quilt. Quite honestly, I took the quilt because my dad told me I should. My grandmother told me that it was made by my great-great grandmother Memie Permelia Moore Smith. I took the quilt and promptly packed it away into a vacuum-sealed bag (more for space concerns than the quilt’s preservation). After I graduated from college and got married, the quilt moved with us (to Atlanta, across Atlanta twice, and then back home to South Georgia) over the course of the next 10 years folded neatly away in its airtight bag. I never really knew quite what to do with it and wasn’t sure I even wanted it out in our home. Our tastes run more modern than old country quilts. In 2009, we were blessed with the arrival of our second child (and our first daughter). In putting together her nursery, I wanted a mix of styles; I didn’t want anything too frilly, too traditional or too modern. 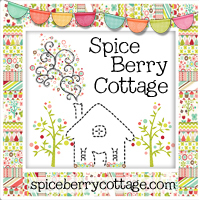 I began thinking about this quilt I had tucked away in a closet and about incorporating it into the décor. 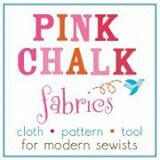 I initially thought that I would use it as a wall hanging, thinking that it would blend well with the mod Japanese animal stamps that would hang above her crib and that it wouldn’t get destroyed by my children and daily use. When I looked at it more closely, I realized that it’s not as country as I once thought. Because of the fabrics used, I am fairly certain that it was made by my Mima (my great-grandmother Ruth Valentine Smith Sheffield) instead of her mother. It’s got some really great fabrics incorporated into it: a blue and white bunny print, some great geometric patterns, and some fabrics I can see being used in 1930s dresses my grandmother would have worn when she was young. 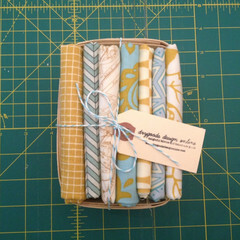 These are fabrics I would buy from Whipstitch Fabrics today myself! The more I considered it, the more I thought to myself: what good is a quilt that isn’t being used? It was meant to be used and loved. 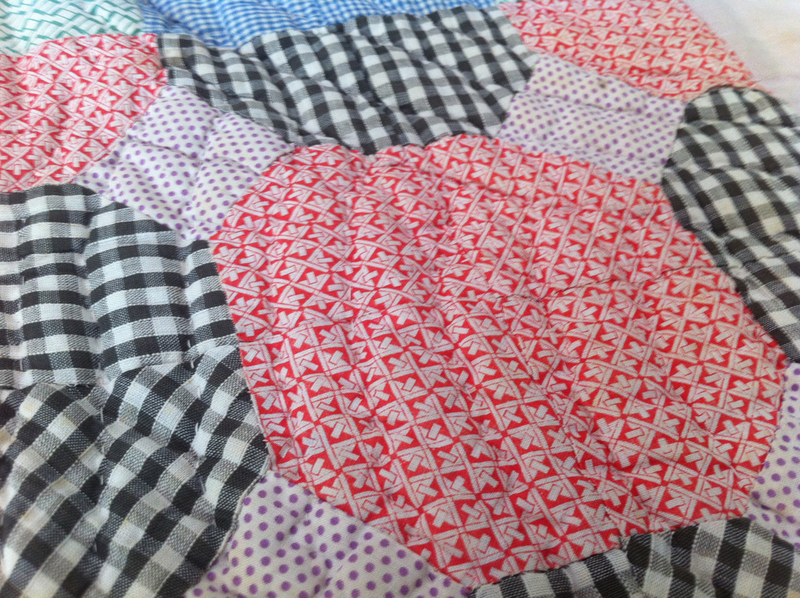 So, I’m going to give this quilt another opportunity to fulfill its destiny. It’s got some holes in the back, and it’s got some frayed and worn spots on the binding. I’m not sure if or how I’ll fix those. I don’t know what the pattern is, and I’m not even sure how to clean it yet. But I do know that when my daughter moves from a crib to a “big girl bed” this month, this quilt will be on it, warming and comforting the sixth generation of my family to sleep under it. PS: If you know the name of the pattern, how I can fix the worn areas and how to wash it, please let me know! Also, the chair pictured is the erstwhile Pepto pink one we got from my great-aunt’s home. It’s one of my favorite pieces of furniture in my home. Great post Liza! Your quilt is amazing as are you! That quilt makes me go “Wow!” NOT a country quilt at all but very contemporary both in design and color. I’d welcome it into my home anytime. Thanks for sharing! This quilt is so mysterious and beautiful, not stodgy at all! It’s so intriguing, I kept forgetting that all the pics were of the same quilt, it looked different in each shot. What a gift to you, to your daughter and, conceivably, to HER children. 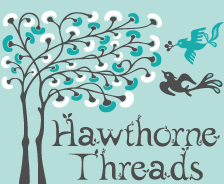 There’s magic in cloth, thread and the love that transforms them into a legacy. 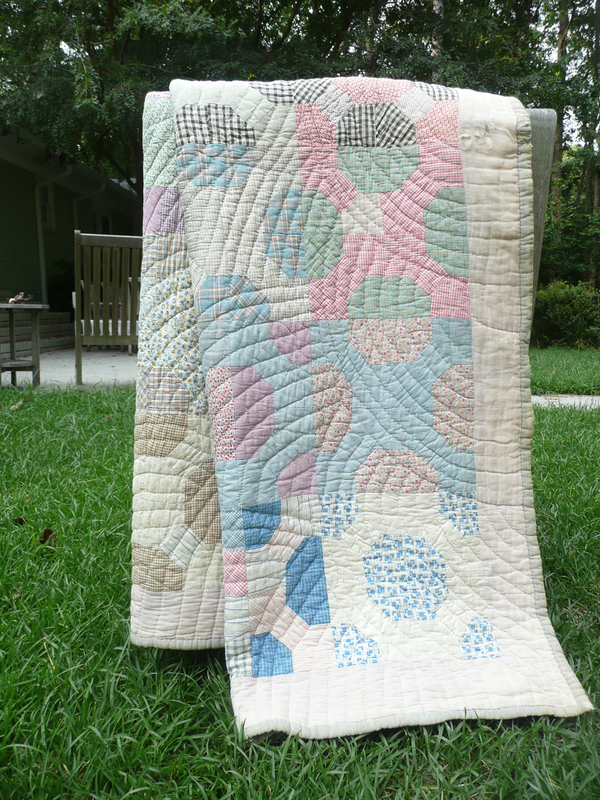 I love making quilts – hand quilted at that. When I give them away the person always says, ‘oh, I’m going to put this up where it won’t get messed up’. 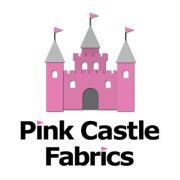 I always ask them to please use the quilt. I am glad to see you are going to use yours. Wow! What a beautiful quilt, Eliza! Your story is as beautiful as the quilt. Enjoy your quilt. Use it so that you can share its history and your memories of your family with your children and other family members. Thank you for sharing!